Two friends (Madhavan and Sharman Joshi) embark on a quest for a lost buddy. On this journey, they encounter a long forgotten bet, a wedding they must crash and a funeral that goes impossibly out of control. As they make their way through the perilous landscape, another journey begins: their inner journey through memory lane and the story of their friend – the irrepressible free thinker Rancho (Aamir Khan), who in his unique way, touched and changed their lives. It's a story of their hostel days that swings between Rancho's romance with the spirited Pia (Kareena Kapoor), and his clash with an oppressive mentor, Viru Sahastrabudhhe (Boman Irani). And then one day, suddenly, Rancho vanishes.... Who was he? Where did he come from? Why did he leave? 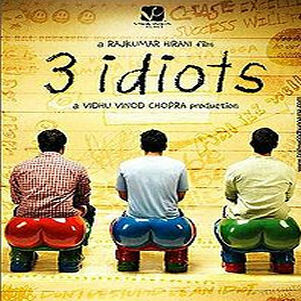 The friend who influenced and inspired them to think creatively and independently, even as the conformist world called them three idiots. Where is the original idiot now? Finally in misty mountains of unparalleled beauty, the friends find the key to the secret.